Downtown Scottsdale is centered around the intersection of Indian School Road and Scottsdale Road; a square mile of shops, bars, galleries, restaurants and many other businesses, surrounded by extensive residential districts. 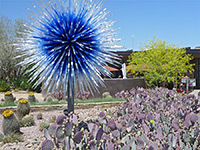 The city boundaries extend just 3 miles south, towards Phoenix Desert Botanical Garden and the Salt River, but over 20 miles north, including a second major commercial area, near the intersection of Scottsdale Road with Loop 101. The southern section of Scottsdale borders the upscale Paradise Valley district, home to several luxurious resorts, and containing the nearest unspoilt desert scenery, on Camelback Mountain; the Cholla Trailhead is 2.5 miles from the city center. The most upscale of over ten Marriott properties in Scottsdale also has a reputation as the best hotel in the whole city, all the more so after a recent major renovation. JW Marriott Scottsdale Resort & Spa occupies a quiet 125 acre site along Lincoln Drive in the Paradise Valley area, with the main building surrounded by landscaped grounds showcasing the varied plantlife of the Sonoran Desert. There are two golf courses adjacent, and all necessary facilities for dining, meetings, weddings, business and leisure right on site. Guests have a choice of 453 luxurious rooms, all with a private balcony or patio, and including a variety of suites, some boasting their own swimming pool. The centrally-located, 8 story Marriott Suites Old Town provides high quality, all-suite accommodation to visitors to central Scottsdale - all the varied attractions of downtown are a short walk away, and Phoenix Airport is 12 miles southeast. The 243 extra-large suites comprise a living room, bedroom and bathroom; all have a flat screen TV, wet bar, comfortable bedding, and a private balcony for great views over the city and the nearby mountains. For dining there is one restaurant/bar on site - Allie's American Grille - plus a Starbuck's kiosk open for breakfast. Leisure choices are a outdoor pool, hot tub, courtyard and fitness center, while for meetings/events the Marriott has 8 function rooms totaling over 15,000 sq ft of space. Highlight of Hilton Scottsdale Resort is the beautiful tropical courtyard garden at the center, site of the outdoor pool, poolside bar, sundeck and plenty of comfortable seating, all surrounded by mature palm trees. The hotel has a north-central location along Scottsdale Road, 3 miles from downtown and 10 miles from Phoenix Sky Harbor Airport. West-facing rooms have fine views of Camelback Mountain; the remainder look out either across the gardens, or the surrounding, peaceful residential neighborhood. Accommodations comprise standard rooms, studio suites and luxury two bed villas, these with floor space in the range 1,500 to 1,800 sq ft. There are two restaurants on-site and extensive meeting/event facilities (25,000 sq ft of indoor/outdoor space). Although accessed from busy Scottsdale Road, Hyatt's Andaz Resort is set well back along a side street, in a quiet, residential neighborhood within sight of Camelback Mountain to the southwest. A variety of restaurants and shops are within walking distance. Accommodations are divided amongst several dozen bungalows, all surrounded by landscaped desert gardens, and all individually furnished, the decor influenced by local history and culture. Floor area ranges from 330 to 835 square feet. The onsite restaurant, Weft & Warp, features an open kitchen and a stylish, glass-panelled setting, while drinks and snacks are also available from a poolside bar; the resort contains three outdoor pools, together with a fully equipped spa (Palo Verde Spa & Apothecary). DoubleTree Paradise Valley Resort is one of the largest, most luxurious and best equipped hotels in Scottsdale, offering 387 rooms & suites and every conceivable amenity. The property extends for a quarter of a mile on the east side of Scottsdale Road; the northern section includes the meeting space (40,000 sq ft, 23 function rooms), while to the south the guest accommodations are divided into several blocks arranged around a number of inter-connected tropical gardens, containing pools, bars and other leisure facilities (tennis court, putting green, racquetball and basketball). All rooms have a private balcony or patio, with views of the gardens or the surrounding mountains. The resort includes a fully equipped spa and three dining outlets. Downtown Scottsdale is just one mile south, while the hiking trails of Camelback Mountain are one mile west. Hyatt Regency Scottsdale Resort adjoins the Gainey Ranch Golf Club, which has three nine-hole courses, and is separated from the hotel by an artificial lake. The 27 acre resort is one of the largest hotels in the Greater Phoenix area, with 500 guest rooms, and amongst the best equipped, offering many facilities for leisure, business and dining. All accommodations feature a private balcony or patio, half looking south over the residential surroundings towards Camelback Mountain, the others with views north across the extensive landscaped gardens to the lake and the golf course. A selection of suites are available. The resort has a spa, a climbing wall, four tennis courts, a fitness center and a 2.5 acre water complex containing waterfalls, fountains and ten separate pools. There are several dining outlets, and a snack market. 70,000 square feet of indoor and outdoor function space caters for a wide range of events. The most central of several Marriott properties in Scottsdale is the Courtyard, part of a group of restaurants, businesses and other hotels a few blocks south of downtown along Drinkwater Boulevard, linked to the main sites in Scottsdale by the free trolley system which runs close by. The hotel is a reliable, mid range, full service establishment offering 180 clean, spacious rooms and all the expected amenities - a cafe (open for breakfast & lunch), a lounge/bar serving dinner, a heated outdoor pool, hot tub, fitness center, business center and three meeting rooms. The fourth Courtyard hotel in the Scottsdale area opened early 2012 along Pima Road at the east edge of the city, close to the 101 Freeway - near Scottsdale Community College and just 3 miles from the downtown area. Features include a welcoming lobby with media wall, a restaurant open for breakfast, dinner & evening drinks, a pool (indoor), whirlpool & fitness center, and 4,000 sq ft of meeting space. There are few facilities close by in this mixed residential/agricultural neighborhood, apart from a Wal-Mart one block south; the nearest shopping center (Park Scottsdale) is a mile to the north. The 112-suite Residence Inn is a late 2019 addition to the long stay accommodation choices in Scottsdale, built right opposite another Marriott property (Courtyard) in between Pima Road and the 101 freeway, part of a small business district adjoining a larger residential area. The hotel offers free hot breakfast, free weekday evening receptions, complimentary grocery shopping service, and full kitchens in all guest rooms, which are available in studio, one bedroom and two bedroom configurations. Two blocks south are a Walmart supermarket and several restaurants. In the Paradise Valley district, 2 miles north of central Scottsdale, the Residence Inn by Marriott has 122 studio or two-bedroom suites (all containing a full kitchen), aimed at longer stay travelers, large groups, or just those guests needing extra space. Free light dinner with beer/wine is served weekday evenings, plus free hot breakfast all days; for other dining there is a good selection of restaurants a block or two north along the main street (Scottsdale Road). All rooms are spotlessly clean, as are the public areas which include a sports court, outdoor pool, hot tub, fitness center, bbq grills and a 38 person meeting room. The Staybridge Suites (open summer 2019) has an easterly location in Scottsdale near the Talking Stick Resort, just across the street from the Pavilions Shopping Center, and also within walking distance of the Salt River Fields sports centre. The Pima Freeway runs past one block east. All guest rooms are suites, and all are equipped with a full kitchen; meals can also be cooked using the bbq facilities. Both daily hot breakfast and weekday evening receptions are complimentary. A free shuttle serves local area destinations. Chaparral Suites Scottsdale rebranded as Embassy Suites Scottsdale summer 2016, retaining its wide range of facilities. The property has a traditional courtyard design, the suites arranged on all sides of two secluded gardens which contain such amenities as an oversized pool, sundeck, fountain and outdoor event space. The onsite restaurant is open for breakfast, lunch & dinner, and provides all-day room service. Hot breakfast and evening drinks/snacks are complimentary. Other leisure facilities are a fitness center and tennis court. The hotel is situated at the Scottsdale Road - Chaparral Road intersection, a few blocks north of the city center. The all-suite Hyatt House chain is represented in Scottsdale by a 164 room property in the Old Town district, along Drinkwater Boulevard, a short walk from numerous shops, restaurants and bars, and also from the long distance Arizona Canal Trail, which connects many Maricopa County districts. Accommodations are one bedroom and two bedroom suites, all equipped with a full kitchen, executive desk, free wi-fi and a sofa bed. Also complimentary are hot breakfast buffet, grocery shopping service and a local area shuttle. A fitness center and market are open 24 hours, while evening drinks and meals are available from the H Bar restaurant. The hotel has seven meeting rooms, totaling 5,032 square feet. Sites within two blocks of Hilton Garden Inn Scottsdale Old Town include City Hall, the main library and Scottsdale Stadium, together with numerous restaurants, bars, galleries and shops. The hotel occupies a large, handsome, modern building of 7 floors and 200 guest rooms, including several types of suite. The sunny southwest side of the complex has a good-sized outdoor pool, sundeck and al fresco dining area, while a tropical garden with palm trees borders the building to the east. Jake's Restaurant, overlooking the pool, is open all day (room service available); snacks and food for cooking using the in-room microwaves can be purchased 24 hours a day from the on-site convenience store. The fitness center and business center are also open 24 hours. New for 2012, the Hampton Inn is part of the Scottsdale Riverwalk development on the east side of Loop 101, built on previously untouched desert plains, part of the Salt River Indian Reservation; the hotel sits just across the street from Talking Stick Resort, which includes a casino and a 36 hole championship golf course. There are many recently built shops, restaurants and other entertainment outlets nearby. The hotel has four floors and 101 rooms, and offers amenities of a free local area shuttle, free hot breakfast, free wi-fi, a convenience store, fitness center, outdoor pool (on the sheltered north side), business center and one meeting room. The pet friendly Hyatt Place hotel in Old Town Scottsdale is situated in a popular area of shops and restaurants along Drinkwater Boulevard, opposite a sister property (Hyatt House); 3 miles from the Desert Botanical Garden and 2 miles from the eastern trailhead for Camelback Mountain. The hotel is set back from the main road a little, lined by palm trees, surrounded by plenty of parking space and adjoining an outdoor pool to one side. Wi-fi is complimentary, as is the daily breakfast buffet. Light meals are available 24 hours a day from the Gallery Market, while a bar serves specialty coffees, cocktails and other drinks. All accommodations contain a sofa bed and a refrigerator. The fitness center and business center are also open 24 hours. Scottsdale's Holiday Inn Express hotel occupies a sizeable area by the Drinkwater Boulevard-Scottsdale Road junction just south of downtown, within walking distance of major attractions like Scottsdale Stadium and Scottsdale Mall. The hotel contains 170 rooms & suites on 3 floors, centered around a tropical outdoor pool area, and offers a wide range of amenities including hot tub, gift shop, business center, fitness center, free above average continental breakfast and free evening reception every day - all of which, together with convenient location, complimentary Phoenix airport shuttle and good staff make this one of the more highly rated hotels in town. The Best Western hotel in downtown Scottsdale is centrally located along Camelback Road, just a few blocks from Fashion Square, Camelback Miller Plaza and Old Town Scottsdale. Best Western Sundial Resort is a modern, boutique hotel modeled on the designs of Frank Lloyd Wright; guests enter through an elegant atrium lobby and can choose from 54 bright, smartly-decorated rooms, all including modern amenities like free high speed wi-fi and flat screen TVs. The hotel also has an outdoor pool/hot tub, business center & meeting space, and a free breakfast bar. One of the most central of Scottsdale hotels, the pet friendly Comfort Suites is less than half a mile from the Old Town district, Scottsdale Mall and Scottsdale Stadium. The 60 extra large, interior corridor rooms have separate living/sleeping areas and are equipped with a microwave and refrigerator. Unusually for a Phoenix area hotel, the swimming pool is indoors, though the hot tub is outside, in the middle of a sun deck. Free breakfast is provided (including a few hot items); the other main services are an exercise room and a business center. Howard Johnson Scottsdale is a typical old-style, exterior corridor motel of two floors, overlooking the parking lot and outdoor pool. All accommodations contain a microwave and refrigerator, and they include a selection of two bed suites. Free continental breakfast is the only other amenity; for other meals there are many restaurants nearby (and shops), along the main street, Indian School Road, which meets Scottsdale Road half a block east. The motel has a central location in the Old Town district, less than a mile from Scottsdale Stadium. The Studio 6 has a westerly location in Scottsdale along Thomas Road, beside the Greenbelt City Park and one block from the Arcadia Crossing shopping complex, which includes a large selection of restaurants. An outdoor pool, meeting room and coin-operated laundry are the main facilities, plus free wi-fi and free microwave/refrigerator in all accommodations. Some rooms have a full kitchen, including stove, toaster and utensils. The building is centered on a secluded courtyard garden, shared with a sister property, the Motel 6. Days Inn Scottsdale is part of the developing area on the east side of Pima Road, close to Salt River Fields and 1.5 miles from Talking Stick Resort/Casino. Downtown Scottsdale is 4.5 miles southwest. The newly built, interior corridor, pet friendly property features a nice outdoor pool area that includes a hot tub and children's wading pool, while interior facilities are a fitness center, business center, coin-operated laundry and a dining room for the complimentary breakfast. Wi-fi and a local area shuttle are also free. All rooms contain a microwave and refrigerator; the suites have a full kitchen, separate living area and extra sofa bed. The limited facilities at the budget-priced Rodeway Inn Scottsdale comprise free wi-fi, free coffee and a microwave/refrigerator in all guest rooms, which are all on the ground floor, divided into several blocks facing the parking lot. There are various restaurants and small shops nearby, around the Thomas Road-Scottsdale Road intersection, a few blocks south of the Old Town district. Motel 6 Scottsdale West enjoys a quiet setting in a mostly residential area along Thomas Road, right next to the Indian Bend Wash Greenbelt, an 11 mile, linear route along the course of a former canal; the center of Scottsdale is 4 miles east. Guest rooms are on two floors, accessed by interior corridors, and some contain a microwave & refrigerator. The motel shares a building with the Studio 6, and is centered on an enclosed courtyard garden with pool and bbq grill. Wi-fi and morning coffee are complimentary. Like most properties of this brand, Motel 6 Scottsdale has two floors and exterior corridors; an L-shaped building along Camelback Road, adjacent to Scottsdale Fashion Square Mall and other nearby large stores. The Cholla Lane trailhead of Camelback Mountain is 1.5 miles west. Affordable rates are the main attraction of the motel, as apart from an outdoor pool, the only amenities are free coffee and a coin-operated laundry. Wi-fi and guest shuttle are available for a small fee.